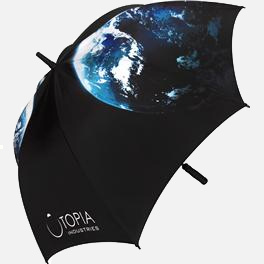 Printed Umbrellas - Print your own promotional umbrellas, huge choice! Did you know that when it comes to marketing your business, promotional products play a massive role in the strategy to connect your business to potential customers? Never under estimate the power of a freebie! Promotional gifts, particularly umbrellas create instant brand recognition. Every time the recipient uses it your company will be visible to them and they will think about you. Likewise walking down the street with your brand on an umbrella is an instant moving advert for your company. Every single time the umbrella is used it could potentially be seen by hundreds of people. So, if you’re looking for printed umbrellas, custom & branded for your business – welcome, you’ve come to the right place! If you’re looking for a unique personalised parasol designed just for yourself – you are also welcome. This is because we offer a personalized umbrella service second to none. Marketing professionals in businesses large or small know the impact of promotional umbrellas. 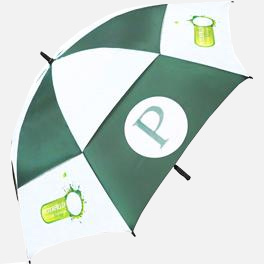 They know that a personalized parasol is one of the most cost effective forms of advertising. At Umbrella Heaven we have been helping businesses and individuals with the design of their corporate, promotional & printed umbrellas since 2005. We have worked with some of the largest companies on the planet. In some instances their promotional umbrella requirement has been in the thousands! However, we’ve also worked with small businesses or individuals. For example we’ve produced many single custom parasols as “one-offs” for individuals who just couldn’t find their required colour combination available anywhere else. Here at Umbrella Heaven, we try hard to respond to demanding timescales when needed. We are a UK based umbrella company. We can offer “Made in Britain” but we can also offer large quantity far east import pricing options when time permits and price is keen! Printed and promo umbrellas – we’ve got you covered! Promotional or advertising parasols, as some people call them, are used by many companies as a way to reward loyal staff and valued customers alike. Printed umbrellas are actually an inexpensive form of advertising. We have produced a selection of printed umbrellas that we believe offers a company a wide choice in regards to styles and pricing. We’ve got traditional golfing brollies at budget prices and top of the range, windproof printed ones, too. 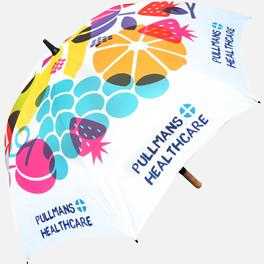 However, we also specialise in unique shapes of printed umbrellas for companies who are looking for quality, but also something that little bit unusual. We have hundreds of printed umbrellas to choose from. Not all of them are shown here on our site. So phone us now on 01525 382938 (+44 1525 382938 if outside the UK) with your printed umbrella requirements. Or email us at info@umbrellaheaven.com with your quotation request for your advertising umbrella needs. Please note pricing below excludes delivery & VAT. In need of promotional umbrellas? Wish to design your own unique personalized umbrella?